When I head out to make photographs, I always strive to bring home quality images. In order to do so, there is so much more involved than gathering the photo equipment, heading to a location and pressing the shutter. 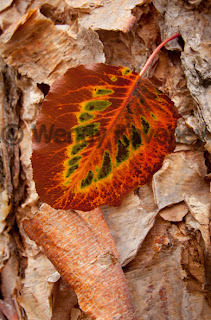 Making a quality image takes time...Photography involves all of the senses and is an ongoing creative process. Last weekend when returning home from walking my dogs I spotted some beautiful autumn leaves dropped from our Bradford pear tree. 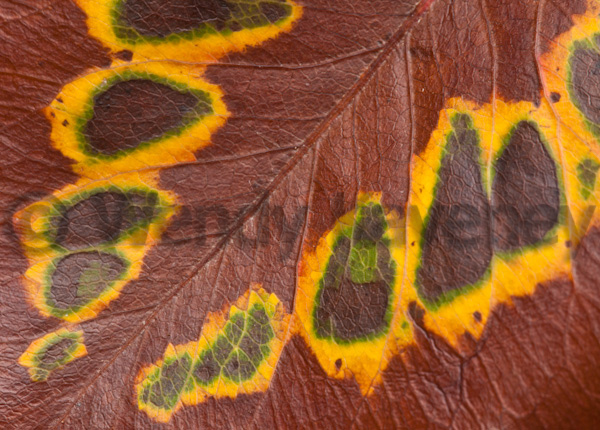 I was taken with the way they had transformed from their summer green color to the rich hues of autumn: not all at once, but obviously in stages, creating intricate patterns of color on each individual leaf. Although I had so many other tasks to attend to in preparation for the Thanksgiving holiday, I decided to MAKE the time to photograph the leaves. I gathered my equipment and headed out into the yard. THREE hours later (YES, THREE HOURS LATER!!!) I returned inside with a handful of images and a feeling of calm. It is the "process" of photography that feeds my soul. I believe a photograph is made up of all one's senses. Taking the solitary time to be in the field to make images slows me down, allowing me to fully experience my surroundings, my emotions, my thoughts and each of my senses. When all of these elements blend together, my creative process kicks in and the photographic experience is enhanced. I have included a few images from my efforts last weekend. Will they ever be printed and shown? Maybe, maybe not. But that isn't the point. 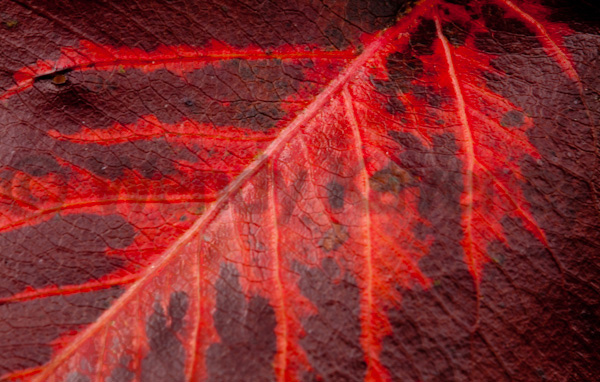 While, to some, they may appear as just images of leaves, it was the total experience I felt while making them that drives me to share them with you at this time. It has been said that "A picture is worth a thousand words." In so many cases that is a very true statement. However, in this day of advanced technology, it seems that video is adding a new dimension to that idea. From the most sophisticated DSLR to the smallest point and shoot (including our mobile phones) most all have the capability of recording video clips- and in high definition at that! When I purchased my Canon EOS 5DMark II, my main reason was for the coveted full size sensor. It happened to be equipped with high definition video, which I thought I would never use. I am a photographer, not a videographer but I am beginning to learn the value of video in addition to the still image. I have shared still images of the traditions of these people in my recently posted Bushman web galleries. 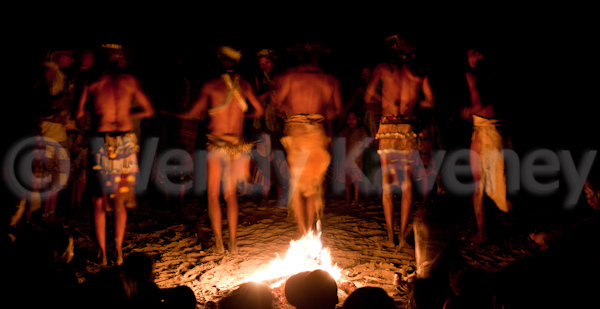 Some of the customs witnessed at the Bushman village translate poorly in just one still image. 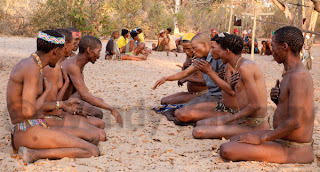 For example, the image below was made during a demonstration of the traditional 'Porcupine Game' played by the men of the tribe. But what is going on here? How could I share the experience with my viewers better? What if I...? 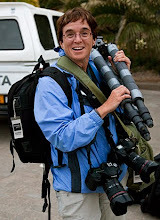 At times when fun or unusual action occurred during my recent travels to Namibia, as often did in the Bushman village, I chose to document the scene with footage in addtion to still images to capture the full experience of what I was seeing. Although I was not prepared to shoot video, (i.e. actually remembering I had video mode on my camera, hand holding the camera, and using the built in microphone) I tried it anyway, and I'm so happy I did! Please excuse the shakiness of the video- This is a new idea for me to embrace and I was simply experimenting with the medium. Click HERE to watch the 44 second video clip of the Porcupine Game in action. One must admit that the footage seen here of the Porcupine Game adds much more meaning to the scene than what is observed in the still capture. In the video, one witnesses energy, changing facial expressions, sounds, rhythm, language, action, interactions and excitement! Will I totally change from still imagery to video? Not likely in the near future- the learning curve of yet another intricate and powerful software program is daunting to say the least! I believe for now, I will continue with still photography and capture video memories for myself and for informally sharing with others. I have always been a 'detail oriented' person. (O.K., I admit... a perfectionist!) Details add a finishing touch to make the ordinary special. This is true in literature, fashion, architecture and photography. 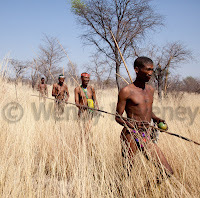 Last week I presented a preview of the Bushman tribe I visited in Namibia. In those images, I shared the people, nothing more. 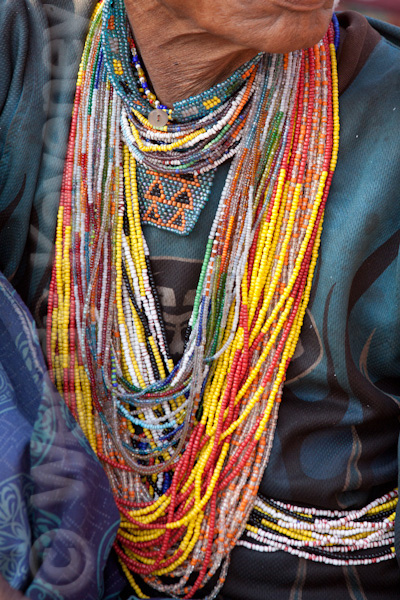 This week, I am including additional (detail) images I made while at the Bushman village. I think they add a finishing touch to convey the 'essence' of who these people are, their culture, traditions and how they live. 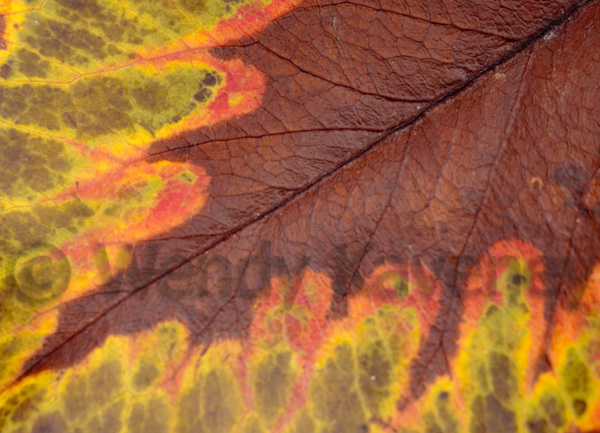 So when you are out photographing...remember to look for, and more importantly, photograph the details! I am weeks into editing my most recent trip to Africa. We saw so much amazing wildlife! 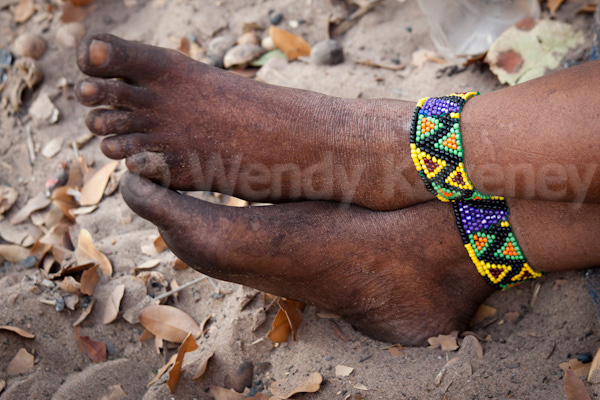 I can't wait to begin editing the images of the animals, but I HAD to begin my editing with the last 2 days of our trip during which time we spent time with a Bushman tribe. What an incredible, life changing and humbling experience! The bushman people are hunter gatherers and were among the first humans to inhabit southern Africa. 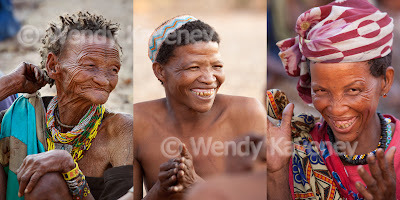 Also referred to as San people, they inhabit the remote areas of the east of Namibia and in the Kalahari Desert in Botswana. 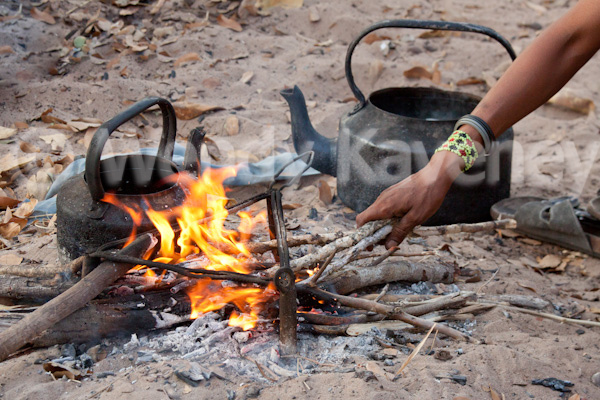 We had the pleasure of spending 2 days at Nhoma Camp near the Bushman village of //Nhoq'ma. During our stay, we were welcomed by the villagers and spent most of our time with them observing their traditional culture and way of life. Nhoma Camp and village is within Bushmanland adjoining the Nyae Nyae Conservancy. Established in 1998, this conservancy allows the Bushman people to hunt for food using their traditional methods and hand made tools. An interpreter from the camp accompanied us to explain the things we observed. 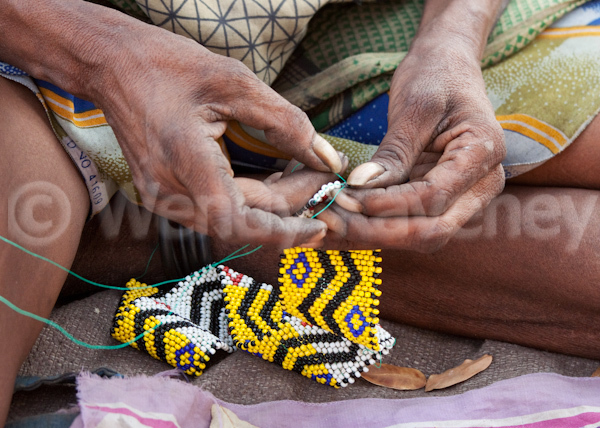 Not only did we see the women prepare the evening meal, but we also witnessed them creating beautiful articles made of beads. Our first evening in the village, we were invited to watch a traditional trance dance. The dance occurs after dark around a fire and lasts for hours. It is one of the oldest religious rituals known to mankind, going back some 20,000 years. 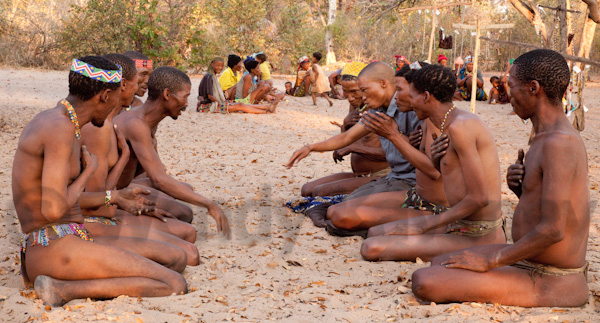 Participants are known to fall into a trance during which they believe they are being spoken to by their ancestors. The chanting was mesmerizing and the dance was fascinating to watch! Day two included a hunt through the tall grasses of Bushmanland with four hunters from the village. During the hunt, we were shown various plants used by the tribe to survive and those used for medicinal purposes. Afterward we were shown how rope was made from leaf fibers, and how traditional animal traps and poison hunting arrows are made. Following the demonstration, were asked to join in some of the simple and entertaining games played by the villagers, including the porcupine game and monkey orange game. 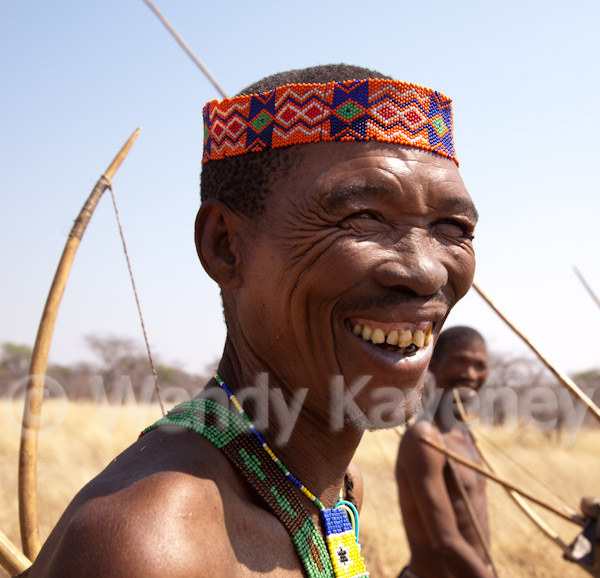 The bushman people are beautiful, open, friendly, and happy people. The tribes that remain still hold on to their native culture and roots. However, sadly, as the 21st century progresses, the traditions of the tribe are being lost as current and future generations adapt to many modern ways of life. I feel so fortunate to have visited and witnessed the traditional Bushman way of life before it disappears into history. Our two days spent with the Bushman tribe will forever be with me and is one example of many experiences during my visit that proves the saying "Africa changes you." A gallery of images will soon be posted to my website, but I couldn't wait to share a few teasers with you.